Tuija Hakkila studied at the Sibelius Academy with Liisa Pohjola and Eero Heinonen, and continued her studies at the Paris Conservatoire with Jacques Rouvier and Theodor Paraschivesco. She studied 20th century music with Claude Helffer in Paris and classical performance practices with Malcolm Bilson in the United States. Other influential teachers have included György Sebök, William Pleeth and Dmitri Bashkirov. She was a Fulbright Scholar at Columbia University in New York in 1985/86. Since 1987 she holds a senior position in piano music at the Sibelius Academy and earned a Doctor of Music degree in 2005. She also taught at the Royal Danish Conservatory in Copenhagen from 2005 through 2008. In 2014 she was appointed Professor of Piano Music at the Sibelius Academy. Hakkila has been the Artistic Director of the Early Music Festival in Hämeenlinna, the Sibelius Academy Concert Series, Kaiho Festival in Espoo and Nurmes Summer Academy and Concerts. She has performed as soloist, in chamber groups and as accompanist throughout Europe, in the United States, Japan, Indonesia, Africa and South America, and has made broadcasts in several countries. She has collaborated with eminent musicians like Karita Mattila, Vera Beths, Anner Bijlsma, Mikael Helasvuo, Sirkka-Liisa Kaakinen-Pilch, Anssi Karttunen, Alexei Lubimov and performed with conductors like Okko Kamu, Jukka-Pekka Saraste, Leif Segerstam and Sakari Oramo. Her repertoire ranges from Bach to contemporary music: She has developed her interest in period instrument performance, presenting classical and romantic programmes on period pianos. She works with a number of today’s composers and is invited to give world premiere performances of new works. 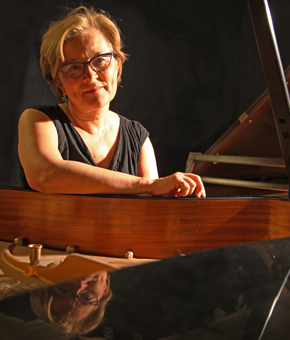 Tuija Hakkila’s solo discography includes the complete cycle of Mozart keyboard sonatas for which she has won acclaim in the world press, a compilation of Jean Sibelius’ piano works, a recital of 20th century piano music and a world premiere recording of the early 19th century Finnish Lithander brothers’ music. A recording with Kaija Saariaho’s chamber music for trio ensembles came out in fall 2012. In addition to this, she has recorded Niccoló Castiglioni’s chamber music, Haydn flute trios and Byström sonatas for piano and violin. In the repertoire for cello and piano her discography includes recitals of 20th century music, Gabriel Fauré’s music and all Beethoven’s works for cello and piano.